Ok, this is the time now. After so much procrastination, I am deciding to write this article. but for me, this article is a “memory chest,” which I will open after years so that I can relive those memories. Ok coming back to point. In 2018, from 1st July to 10th July I went on a Spiti valley trip with my three college friends (will introduce them below). In this trip we cover various city, did road trip (by bike) from Manali to Kibber via Kaza and also did Kanamo peak trek. Note: I will also share information for readers who planning to visit those areas (information like hotel, guide, bike dealer number etc). Such information marked with “ Some Information ” title. Damn this was the hardest time. Because we counting each day, waiting for trip day like there was nothing left in life. Such excitement happened because we (friends) planned this trip around two months earlier. We have nothing to do, all we have to do was count how many days left and then change whatsapp group name according to days left. During this time, we did lot of research and did some pre-booking for homestay in Manali and also for bike rental (below I will share that information). I am getting excited to write this, did you also getting excited to read further? So July 1st evening was the date on which we have to catch our bus from R K Ashram Marg Delhi Metro Station (bus stand is below metro station). I reached early and waited for my friends. And here they are, just reached 5 minutes early (before bus start). We settle our-self in bus, and after 2 hours we are out of Delhi and hitting national highway below are some shots taken before dinner. We booked our bus tickets from Red bus. If you book early then, you can get tickets at less cost. Around INR 1,200/per person we paid for one side journey. Ride was going well, after all it was AC Volvo bus. Bus driver took a break around 9 PM for dinner (below are some snaps). Whenever I woke up, then I was waiting for sunshine, so that I can enjoy outside view. After total 12 hours bus journey, we finally reach Manali on July 2nd morning. It was around 7:00 AM when we reach also little rain shower was going on (after all it was rainy season in Manali). In few minutes we booked auto for Vashisht (place where we booked room). July 2nd was a relaxing day for us. After reaching Sunface homestay (place where we stay), we had breakfast and in evening we went to bike owner shop (regarding bike rental). Sunface Homestay is good and less costly. Good for individual and group travelers. You can book room from booking.com. Also, you can call Mr. Bablu (owner) for booking +91 8360863871 (use this article as reference). This homestay is in Vashisht, which is 2 km far from main Manali. At Katoch bike rental shop, checking bike condition. We rented our bike from Katoch bike ride. Mr. Rajeev (owner) provided us very good condition bike and he also arranged spare tools, helmets and permit for us. Price for 350cc classic is INR 1,200/day. For booking, you can call him on +91 9816003556 (use this article as reference). Raj pani hai room mai? For July 3rd plan was to test bikes and visit solang valley (famous for snow sports activity). Solang valley is 15 km away from Manali, so we did not make any hurry to leave. After spending good 2- 3 hours at solang valley we decided to go back because rain started and weather become more cloudy. Below are some pictures taken during that time. We had our lunch outside and then visited local shop for some shopping. Till now it was a trailer of whole trip, real trip was yet to begin. We are excited because next morning we going to experience our first road trip. We all four was mentally ready and packing everything for next day, because we have to leave early (according to plan). Day on which we have to cover 150 Km (80% off road). Not just riding thrill, we also had bonus for that day and it was rain. Anyhow we manage to wake up early, till 7 AM everyone was ready but to tie our luggage (as it was our first time), fill complete fuel and withdraw money from ATM it took us extra time and around 8:30 AM we are completely ready to go. For us, Spiti road trip was exciting from beginning because from beginning we had to witness beautiful and dangerous Rohtang pass. Oh Boy what a ride, what a view !! Seriously image here not doing justice. Being there and riding on those curves was something else. Did you remember, above I said about some bonus? Yes, it was bonus time, means it started to rain. Luckily we are prepared for that and having raincoats. But still, that chilly weather made us shiver. Rain + wind + bike it was an extreme combination. Our finger was numb literally. I still remember, at the top of Rohtang pass my friends wash their hands with tea (which we bought for drink). I hope you can imagine that level of cold. With rain, there was a big surprise for us and it was slush. 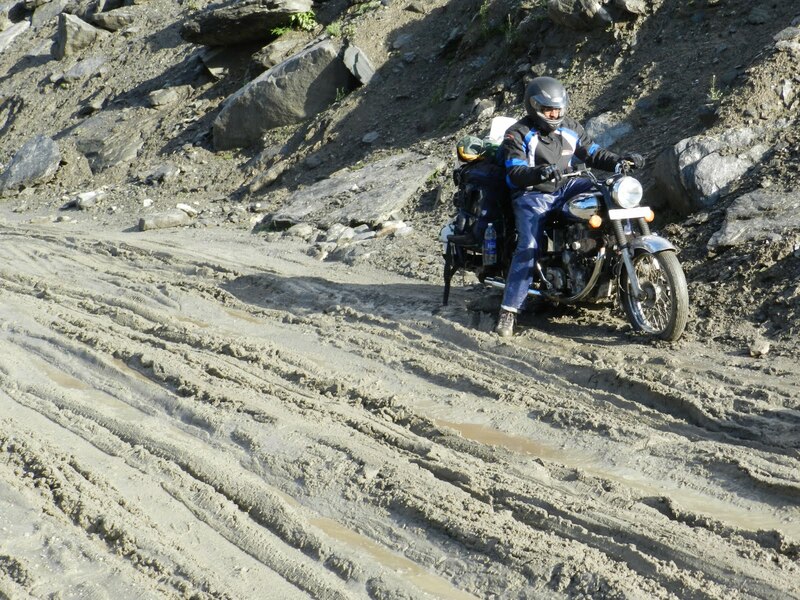 Yes, slush (mixture of water and mud) at Rohtang pass is too dangerous for bikers. Especially when we cross Rohtang (downhill). That moment was not “fun” it was a challenge !! We started at 8:30 AM from manali and at 12:30 PM we took break at Gramphu tea stall (after crossing Rohtang pass), you can imagine road condition that in 4 hours we just completed 65 KM, but still no issue as we know that it was part of Spiti road trip. Finally, we got some relief at 4 PM when we took lunch break at famous chacha-chachi dhaba. I still remember that rajma chawal. After having our lunch we went towards Losar, which was still 30 km. Good thing for us was that, weather getting clear. As we were going towards cold desert mountains of Spiti. From Gramphu to Losar there is no road, It was just rough patch of stones. During this patch, we faced water crossing and light rain shower. Till now as a bike pillion, by back was hurting so much (same story with Varun). Seriously, I will recommend everyone to not sit on royal enfield classic as pillion, especially for such bumpy roads. We reached Losar around 6 PM and stay that night at Atisha guest house. Tough journey was completed, faced rain + wind + slush + body pain etc but at the end of day it was time to relax. From bike, we can cover distance from Manali to Kibber (via chicham) in a day. Just we have to leave early in morning around 6 AM. Also, at Losar there is good facility to stay. July 5th morning, it was sunshine !! No cloud no rain, just clear weather and this what we actually need. No hurry in morning as we know that further route was good, so we enjoyed sunrise and breakfast. Around 9:30 AM we leave from Losar guest house, on that day we have to cover 80 KM to reach Kibber village via Kaza. That day was perfect for all outdoor activity. Complete sunshine and clear sky, perfect for photography bug. Sharing some images till we reach main city Kaza. Around 1 PM we reach Kaza (the main city in Spiti valley). For that day our Goal was to go Kibber village but we took different route so that we can fix some small issues with our bike at Kaza bike repair shop and also during that route we will also get chance to visit world famous Key Monastery. After Manali you will find bike repair shop and petrol pump at Kaza only, better to take spare tools with you. Also, with full tank of classic 350cc you can easily reach to Kaza. After Tibetan lunch at Kaza, we went towards Key Monastery. Key Monastery is place where Tibetan Buddhist people live and pray. Place was good and normal, nothing fancy as expected. But at Key Monastery we witness some cute moments when little Buddhist kids getting excited for Ice-cream. 4 PM we reached at kibber village and decided to stay at Deshek Homestay. Deshek homestay is best option for stay in Kibber because it is affordable, view is good and Indu didi (owner) take good care of guest. For booking, you can call on this number +91 8988391949 (use this article as reference). Also, you can ask Indu didi for local guide. Seems July 5th was all good day for us, right? But actually, it was not that easy. I am sure you heard about AMS (Acute Mountain Sickness). If not then let me give you just small info that at high altitude you feel unpleasant headache. Must carry Diamox and ORS with you for AMS prevention. If you going on height without acclimatization then take Diamox before 12-24 hours. After Kaza, we all facing headache. We know that it was because of high altitude and we have to drink lot of water. Going back or towards lower altitude was no option for us. Coming Kibber and staying there was part of plan (generally tourist stay at Kaza). And that plan was to do Kanamo Peak Trekking next day. With AMS symptoms, it feels like we all were going to drop trekking plan for next day, In-fact I was also agree at some moment (for me trekking was important in that whole trip). While planning of this trip, we underestimated trekking difficulty and decided to give just one day for this high altitude 5,975 meters 13 km trek. We had to give at least two days for this trek and one extra day for acclimatization. But nothing can be done at that time (when we staying at Kibber homestay), we decided to let things go on for next day and whatever will happen then will take care during trek. It was cold night and clear sky with full of stars (seriously that many stars I didn’t see in my life). We enjoyed that moment and went to sleep early, because next day we have to start early. July 6th, It was trekking day for us. Bahi cancel ker dete hai. We went for Kanamo peak trek with a local guide, after few minutes drive we start our trek from Tashigong village. It was again bright weather with no sign of clouds. Kanamo peak trek starts from Kibber village and generally done in two days. Also, you have to pay INR 500/person for village development, in case you want to go for trek. In past I did lot of treks, most of them are in forest areas. This Kanamo peak trek was in desert, there was no river and no sign of tree for shadow. So dehydration process was very fast, with few minutes of hiking we all are suffering from heavy breathing. Seriously it was tough !! Anyhow we all manage to complete 7 km of distance in 6 hours, after that we did lunch. After lunch, my friends refuse to climb and at that time I did not push them further because it was hard choice for me also. Around 5 km was left to complete trek but challenge was those 5 km was total steep (in below image background you can see that mountain). I decided to push myself further and to give my 100%, no matter I manage to complete or not. After few minutes of hiking, I know that it will be extreme climb for me. At that time I am fighting with lot of things like dehydration + sun + wind + no company of friends. During climbing many times I asked myself, that I am fighting with these things for what reason? and every time I answer myself “to know your potential”. After 1:30 hours of pushing myself, my body completely exhausted and I decided to stop going further. I was just 2.5 km away from Kanamo peak, I can see top with my eyes but that day was not my day !! Final height which I achieved during climb was 5,458 meters (17906 feet). And from that height view was magical, I can see Kaza and Chicham village together (20 km separated) from that height. After saying goodbye to Kanamo, at 2:30 pm along with my guide I started downhill trekking. Downhill was fun and easy, It took me max 15 minutes in downhill (during climbing it was 1.5 hours). My friends were waiting at our lunch spot, after meeting with them we all together headed towards Kibber village. After few hours of downhill and bike riding, we were back at our homestay. Nothing left for that day, we have to do dinner and take rest and that was the only thing which we did after reaching. July 7th, new day with new energy. On that day we have to go Chandratal Lake, which is 75 km from Kibber village. Chandratal is in route towards Manali, we just have to take extra 10 km before Batal. We started at 10 AM in morning from Kibber and reached Chandratal at around 3 PM. During that journey, we also visited Kunzum pass. At Chandratal there were several tents, so we planned to stay there for that night. After finding one affordable tent, we booked it and took some rest. Camp cost is high at Chandratal, it starts from INR 800 to 1500 per person. So if you want to save money then you try to visit Chandratal in afternoon and then stay at Batal (15 km far). After few minutes of rest and having worst cup noodles, we decided to go towards Chandratal lake. Before trip we heard lot about Chandratal lake and after reaching there we can realize why it is such an attraction point. Definitely, it is like a perfect dream lake which you can imagine. So as like all tourist, photo session began. Took lot of pictures and spent good hours of time near lake. It was wonderful time which we spent at Chandratal lake, after sunset we came back towards our camp location. Camp management team provided us dinner and then we went for sleep. July 8th, that day we only had one goal which was to reach Manali (which was 125 km). We know how rough road was and how weather, water crossing and traffic jams can consume our time, with all this in consideration we started early morning at around 7 AM from our camp (at chandratal). Road was rough and ride was bumpy for bike pillion, but we can’t do anything in that. Luckily weather was clear and there was less water in water crossing. Around 12 PM we reached Gramphu and joined Leh Manali highway (finally it was tarmac road). Till Gramphu, little bit of energy was left in my body but that was all gone because of big potholes on national highway. Anyhow we fight that dust + traffic + potholes and came to top of Rohtang pass. While crossing Rohtang pass (going towards Manali), we saw paragliding spot and Varun decided to do that. I did paragliding in past and wanted to do that again but at that time we are out of cash. There are various places in Manali where you can do paragliding. I recommend you to do paragliding at Rohtang pass because view is great. Paragliding will cost INR 2000/person for 3 to 5 minutes flight. I am sure Varun had wonderful experience. Anyhow, at around 4 PM we reached at our old location, which was sunface homestay. So Spiti bike trip was ended there. Rest of the day we relax, return bikes and went to mall road. 9th July was the final day of our trip, that day we have our return bus at 6 PM. So we had few hours of time in morning, to utilize that few hours we went to Jogini waterfall (it was near where we are living). Now, it was time to leave. On July 10th morning at around 8 AM we reached Delhi, and then we went towards our normal life !!! So why I did this? It was defiantly an experience which I am going to remember forever. In the end, it was not about that Spiti bike trip or high altitude trekking. For me, this trip is about memories which I shared and lived with my friends, experience which I counter and most important “time for myself”. Raj, Varun and OP for making that plan into reality !! Also, I will love to read comments and will be happy to answer any query, feel free to use below comment box. Why You Should Outsource Digital Marketing? Wowow… It’s really awesome sir (Mr. Blogger) . Nice place ️️️ nd nice shot ..